Langeroo has a great ‘Musical Instruments’ topic. Each musical instrument has its own matching picture, sound and written word so the activities can be accessed by children of all abilities. In most Langeroo games/activities, you have the opportunity to choose to hear the spoken word or not. This means that you can use Langeroo games and activities with older or more able pupils who are less reliant on sound cues and are developing reading skills. In addition to using Langeroo to identify musical instruments, you can also use it to sort them into categories – beating, blowing, shaking and plucking (for young learners) or the four sections of the orchestra – percussion, wind, brass and string. 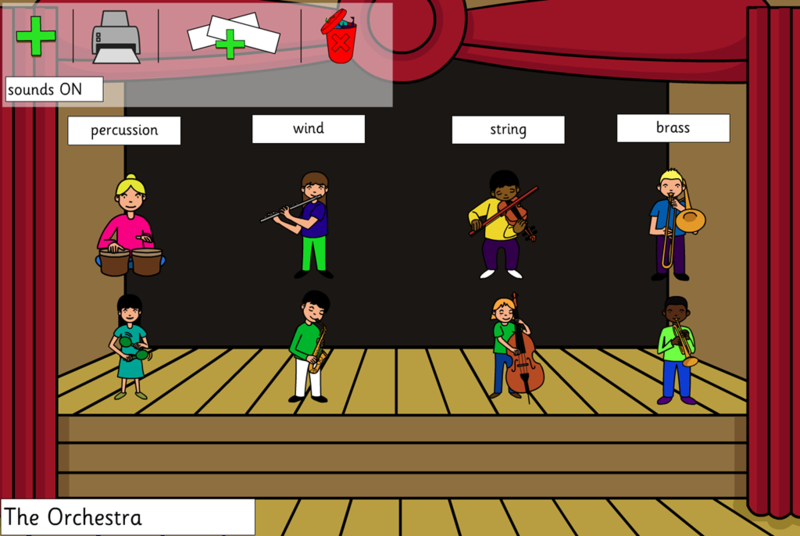 The Scene Maker is a great tool to help visually sort instruments and also for children to create their own orchestra scenes and hear the instruments play! Simply create your category labels – percussion, wind, etc. and let children drag and drop the instruments into the sections. To create scenes, drag and drop the instruments, use the labels provided or create your own (in any language providing you have the appropriate keyboard). This looks fantastic on an Interactive Board and really draws the attention of the children. All the games/activities in Langeroo can be used/played independently, in small groups or as a class on PCs, MACs, interactive boards and some tablets. Each musical instruments has a flashcard that can be printed and used in card games – pairs, snap etc. or enlarged and printed for bright, colourful display. We’re sure you have lots more ideas. Please share them with us so that we can share them with the Langeroo Community.